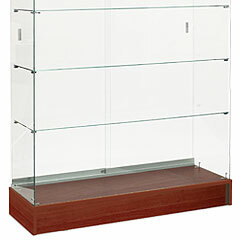 What features set these large display cases apart from the online store cabinetry crowd? These shadow boxes are upscale yet inexpensive wood and metal museum cases with tempered glass shelving and doors. Each of these large display cases, also known as quality store cabinets, are designed to highlight fine or expensive merchandise. These floor standing retail fixings are smart looking against a wall due to high end styling. But their excellent craftsmanship is available at an affordable price. 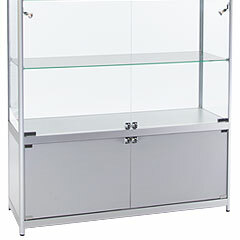 Selecting these large display cases, like trophy cabinets, keeps your organization under budget, without sacrificing quality. Each of these store cabinets showcases numerous sizes and types of collectibles, from antiques, to memorabilia and awards, to retail merchandise. 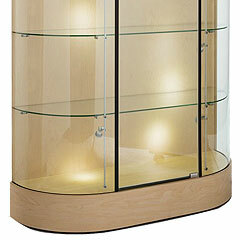 These large display cases are offered in MDF construction with stunning wood or metal finishes. They come in myriad widths and heights. Select from rectangular and half-round oval designs, with or without a regular or raised base for storage. Each unit comes with tempered glass shelves and sliding or pullout doors. Some options include adjustable legs to keep the presentation level on uneven floors, and wheels for easy transport. What types of affordable store cabinets and shadow boxes are for sale? 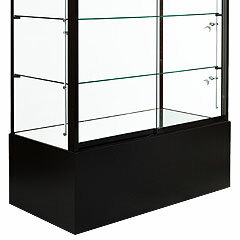 Large display cases come in rectangular and oval-half-round shapes, with plain or raised bases for storage, and other architectural flourishes, with full- or half-vision configurations. Cabinetry is available in a variety of heights, in widths from 48” to 75” wide to accommodate all types of merchandise, museum objects of art, or trophies. Showroom curio is sold frameless w/ acrylic or tempered glass sides and doors; or framed in black or silver metal, or melamine laminate (MDF) with wood finish including maple, oak, and rose. Retail enclosures are available with super durable tempered glass shelves with sliding or swing open doors; some of the shelving is adjustable, and some units come w/ a mirrored backer for depth. Some showcases feature halogen lighting options at the top and sides to draw the eye to fine or small collectibles; easy-switch systems w/ on/off buttons are included to save electricity and time. 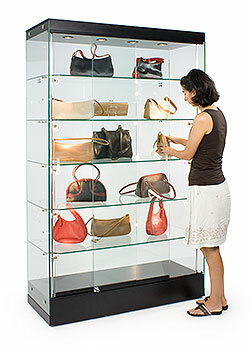 Store cabinets such as these are typically used in retail venues and hotel lobbies. Place these units in school or gym hallways to show off trophies and statues for sports or scholastic achievement. Set them up in libraries, and offices, for displaying corporate awards, historic memorabilia, and art shows. These are real statement-makers that blend style, function, and affordability. Some of these examples have wood look canopies to satisfy a more traditional décor, while others are frameless, with acrylic sides and a mirrored backing, for a contemporary flair. Most of these curio cabinets lock to keep valuables safe and protected from over-handling, damage, and theft. Lighted options are available for putting the spotlight on smaller, finer items like jewelry that might be overlooked in an oversized showcase. These display cases should be the first step in laying out your store marketing plan, as they will directly help you showcase, advertise, and sell merchandise. Highlight fine jewelry and watches, dolls, china, objects of art, trinkets, antiques, beer steins, and trophies as well as electronics, picture frames, sweaters, purses, wallets, belts, and scarves. Tall, wide cabinetry with ample shelf space, in some instances with storage below for overstock and personal belongings, helps push goods off the shelves. Narrow alternatives are also available here, for tinier arrangements of products, so they aren’t buried out of sight. The selection of display cases here is massive, so take the time to browse each layer of the online store to see all the ways you can custom outfit your real-life shop or showroom with top end cabinetry at affordable prices. These big cases are sized 48”W to 75”W, providing tons of room for collectibles and merchandise-for-sale. These high quality affordable cabinets are sold in rectangular or curved-front styles, frameless and silver or black metal for modern showrooms, or with oak, maple, cherry, and rose wood finish; and architectural elements like a canopy, for more traditional tastes. These curio cases come with sliding/space-saving tempered glass doors with locks. 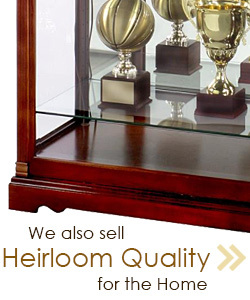 High-priced items, antiques, and museum collectibles are kept safe from theft and over-handling. Some models are crafted by renowned designers Grace Tyler, California (known for its narrow width dimensions), Morrison & Hewitt, and Howard Miller, for a truly upscale look clients will recognize. These top quality shadow boxes that are museum showcases stand against a wall, with halogen lighting options on the sides or top (or both), with the number of lights reflective of the size of the case. These inexpensive store fixtures cannot come closer to perfection when it comes to protecting, showcasing, and encouraging the sale of contained merchandise. The curio cases acts as oversized shadow boxes in a gallery or museum that are commonly used as store fixtures. Each of these large display fixtures is designed with half- or full-views for show casing anything from eye glass frames to an antique doll collection. Check out large display fixtures with halogen lighted cases for increased light and clarity on treasured objects. This collection is priced to save money while moving merchandise.